It’s an impressive list, but for a golf club this honoree won’t be topped soon. Joining names like Fran Tarkenton, Bobby Dodd, Joe Torre, Bo Jackson, Dominique Wilkins, Evander Holyfield, Herschel Walker and Chipper Jones, the Atlanta Athletic Club honored golf’s greatest professional player with its W.R. McGriff Trophy on Monday night. 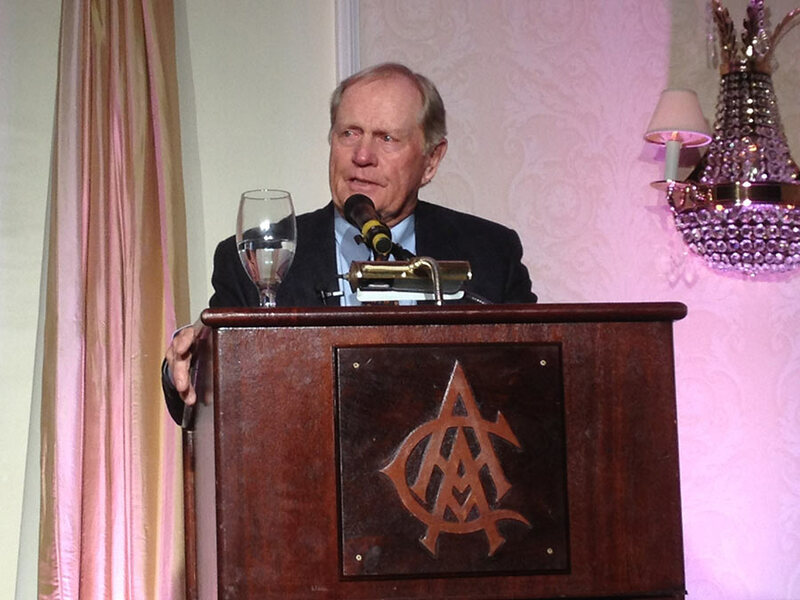 In front of more than 400 people at a dinner in his honor, golfing great Jack Nicklaus spent more than an hour answering questions from Emmy-awarding winning broadcaster Jimmy Roberts before receiving the trophy from the club’s Heritage Committee chairman Davis Stewart. The award recognizes “excellence in sports” and is named for the longtime Director of Athletics at the club, W.R. “Buzz” McGriff. This was the first time since honoring Stewart Cink in 2010 the Atlanta Athletic Club bestowed the W.R. McGriff trophy, a kickstart to the buildup to for the 2014 U.S. Amateur Championship hosted by the Johns Creek course. In his presentation, Stewart made quick mention of Nicklaus’ two U.S. Amateur victories in 1959 and 1961. Nicklaus’ son, Michael, is a member of the Atlanta Athletic Club, giving a local connection to his Ohio-native and Florida-based father. “This is a nice honor to receive this award from a club which my son thinks so highly of,” Nicklaus said. The honor belonged more to the crowd. In the two-hour event, the 18-time major champion received four standing ovations from the members and responded with the generosity of his time, telling stories of his career, doling out a few golf tips and answering some select questions prepared by the club’s junior golfers. This was his first visit to the course since the 1981 PGA Championship, when Nicklaus arrived as the reigning champion. If any theme wove through all of Nicklaus’ remarks, his smile and shrug of the disappointment of losing that tournament reflected his message. Nicklaus bragged about all five of his children receiving Division I athletic scholarships and smile brightly when talking about his grandson, Florida State tight end Nick O’Leary, being named a finalist for the Mackey Award giving to the top tight end in the country. Roberts chipped in with the story of Nicklaus leaving the President’s Cup this fall at his Muirfield Village course in Dublin, Ohio on Saturday to go watch O’Leary and Florida State play a football game. When he talked about golf, that was his message. He walked the crowd through 1-irons he hit in major championships. There were three, at 1967 at Baltusrol, 1972 at Pebble Beach and at Augusta in 1975. He gave yardage, pin placements and cross winds. He bemoaned missing the putt at Augusta. There was the time when he was 15 and met Bobby Jones for the first time and the note Jones left in his locker every year at The Masters inviting him and his father, Charlie, to his cabin. He told the story of the hospital that saved his 1-year-old daughter, Nan, after she swallowed a crayon giving him and his wife, Barbara, the motivation for their charitable giving through the Nicklaus Children’s Health Care Foundation. He gave the briefest, yet best, synopsis of his life. He played golf for a career, has 22 grandchildren, designed golf courses, sold golf equipment and has the ability to spend as much time with all of his family as he pleases. “I’ve been a pretty lucky guy,” he said.